Baseball cleats are regulation uniform for all professional and most amateur baseball associations. The pronged underside of cleats allows for players to maintain traction on grass and dirt surfaces. Base-runners require cleats to ensure maximum stability while they steal, slide, and dash between bases. Moreover, cleats are especially important for outfielders who spend the majority of their playing time swatting gnats while their feet rest unsteadily on wet grass. Baseball cleats are not crafted like football and soccer cleats. Unlike soccer cleats, baseball cleats feature a spike located beneath the toe portion of the cleat. This toe-spike is not found on soccer cleats, mainly due to the potential dangers occurring in a sport that relies heavily on kicking maneuvers. Baseball cleats also possess a midsole, and usually boast a high to mid-cut cleat, which provides the wearer with improved ankle support. Many baseball cleats are fashioned with metal spikes. Metal spikes are not permitted for use on football cleats. Football cleats also contain a center toe cleat that allows for improved traction during quick starts. Where the actual sole is concerned, baseball cleats are either manufactured using molded rubber or metal. Some molded cleats actually employ hard plastic. 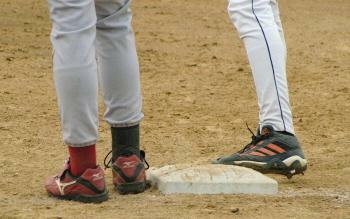 Many youth and amateur baseball associations do not allow the usage of metal cleats. As mentioned before, metal cleats pose a considerable threat of injury, especially during base-running. Therefore, for the purposes of player safety, these baseball associations insist on the usage of rubber-pronged cleats. Metal cleats also jeopardize the integrity of a field's surface, causing damage to freshly trimmed grass. However, metal baseball cleats are valuable on extremely hard fields where extra traction is necessary. Baseball cleats can be crafted using a variety of leathers and/or synthetic materials. Higher quality cleats will use leather as a main crafting material, simply because leather's properties allow the material to stretch and mold to the feet. Moreover, leather remains flexible and is generous regarding air circulation. The ¾ height cleat is cut higher in order to provide superior ankle support while protecting the lower leg's connective tissue from strain. However, some players will find the ¾ height binding and restrictive, thereby favoring the low height cleat. Some styles of baseball cleats provide interchangeable prongs so that the wearer can alternate between metal and molded prongs. Adidas has patented a ClimaCool system for its baseball cleats. This ClimaCool system provides ventilation for players through the use of a perforated sock liner, thereby increasing air circulation and keeping feet fresh and unfettered. Metal baseball cleats have a clear advantage over rubber cleats when it comes to traction. The sturdy and unrelenting qualities of hard metal make metal baseball cleats a reliable source of traction when one is playing on any form of turf. However, many amateur baseball leagues forbid the use of metal cleats in order to safeguard their player from injuries as well as to protect their fields from excess damage. Baseball can be a messy ordeal, particularly when the playing field has been recently exposed to heavy rains. Cleats can become impacted with dirt and field debris. Impacted material needs to be removed from the prongs before each consecutive use, as this build up will lessen the traction performance of the cleat. When dirt hardens on the cleat, it can become very difficult to remove from the sole. A light application of water may prove helpful. However, some people find it simpler to let the material harden, later scraping the dried dirt from the cleat using a stick or their fingers. Wet cleats should never be exposed to a heater. Heat sources will dry out the cleat and make it stiff. Heaters can also crack the leather. In order to maintain the cleat's shape, it is recommended that newspapers be stuffed inside the shoe. Baseball cleats can easily be purchased at Foot Locker, online at WePlay Sports, and at Champs Sports stores nationwide. On average, a pair of quality cleats will cost upward of $100.